Available in both 4-door sedan and hatchback versions, the entry-level Kia Rio has developed a reputation as a competent subcompact, with solid performance for its class and a cabin that's larger than you'd expect. For 2016, the Rio gets a mild mid-generation refresh, designed to tweak its appearance both inside and out and make it just a little more appealing to buyers on a budget. Most of the 2016 updates focus on the car's exterior look. The front end gets a new fascia, a revised grille insert, repositioned headlights, and new foglight surrounds, which make it appear a little more dashing. The distinctive geometric grille, referred to as a tiger-nose grille by Kia, now better matches those found on the Optima and the Soul, creating a design unity across the lineup. The headlights have been moved inward for a more aggressive appearance, and the lower front valance provides a more horizontal line that's echoed in the rear. The foglights now feature satin-finish bezels. In the rear, Kia has redesigned and repositioned the reflectors, moving them to the corners, and updated the rear fascia. In addition, two new colors, Urban Blue and Digital Yellow, are available for 2016. It's not an overwhelming redesign, but enough to keep the Rio looking fresh for the next couple of years. Inside the cabin, passengers will find plenty of headroom, though legroom in the back might be tight for taller passengers. Most reviewers find the cabin comfortable, though sparsely equipped for the lower-end LX trim. However, for 2016, owners of the mid-level EX trim can opt for a new two-tone Designer Package, which features unique black cloth upholstery with gray leatherette trim and gray stitching, gray stitching on the steering wheel and shifter, and gray padded door panel inserts. All trims, including the sporty SX, get new satin-finish bezels around the air vents and additional high-density foam in the A and B pillars, which helps reduce cabin noise and vibration. The 2016 EX and SX trims also come equipped with a new piano-black center-console surround. The list of standard features for the LX lacks such items as power windows, power door locks, cruise control, a telescopic steering wheel, and such niceties as a center console with storage and paddle shifters for the automatic transmission. It does, however, include air conditioning, a 4-speaker audio system with satellite radio, an auxiliary input jack, and steering-wheel-mounted audio controls. The EX adds a 6-speaker audio system, steering-wheel-mounted cruise control, dual LED map lights, and premium knit cloth upholstery. The SX remains the best-equipped Rio trim, with such features as a navigation system with a 7-inch touchscreen display, HD Radio, a rear camera display, push-button start with a smart key, steering-wheel-mounted paddle shifters, heated front seats, and leather upholstery. Aluminum pedals and a leather-wrapped steering wheel and shift knob enhance the SX's sporty feel. Outside, the SX also gets power folding exterior mirrors with integrated turn signals, a power sunroof with tilt, and rear LED lights. Both the EX and SX come equipped with front foglights. Trunk space in sedan trims checks in at 13.7 cubic feet, about average for the class. In the hatchback, that expands to 15 cubic feet and tops out at 49.8 cubic feet with the rear seats folded down. All trims include a 60/40-split rear seatback that folds flat, making for fairly expansive cargo space in the hatchback. Power for the Rio remains unchanged for 2016. A naturally aspirated 1.6-liter 4-cylinder engine producing 138 hp drives all three trims. It develops 123 lb-ft of torque, channeled through either a 6-speed manual or a 6-speed automatic transmission in the sedan. For 2016, Kia offers the hatchback version only with the automatic. The 4-cylinder engine delivers good acceleration, thanks in part to gasoline direct injection (GDI), putting the Rio near the top of the list of budget-friendly subcompacts when it comes to power and performance. However, it doesn't quite match competitors like the Ford Fiesta in that category. Fuel economy numbers check in at a relatively decent 27 mpg city/37 highway/31 combined. Kia equips the SX with a sport-tuned suspension, which results in good handling, though some reviewers find it too stiff for long-distance travel and comfort. They suggest the LX or EX for a more pliable ride. The front-wheel-drive Rio rides on MacPherson struts with a stabilizer bar in the front and a coupled torsion beam axle with gas shock absorbers in the rear. The configuration results in responsive, well-balanced steering and a stable ride, especially over long distances. The SX gets 17-inch alloy wheels, while the LX and EX both ride on 15-inch wheels. All the expected safety features are here, including 6 airbags, 4-wheel antilock disc brakes, electronic brakeforce distribution, and hill start assist control. The NHTSA gave the Rio an overall safety rating of 5 out of 5 stars, while the IIHS awarded it a Good rating for front and rear crash tests, and an Acceptable rating for side-impact crashes. Generally, the Rio receives good marks from reviewers, who like its solid performance and handling, and the well-equipped interior in the middle and high-end trims. However, they warn that the lower-end LX trim might be under-equipped for some buyers. The Rio's reliability scores are good, adding to its value. Overall, the Rio stacks up well against its competitors, including the Honda Civic, Mazda3, Chevy Cruze, Hyundai Accent, and Ford Fiesta. 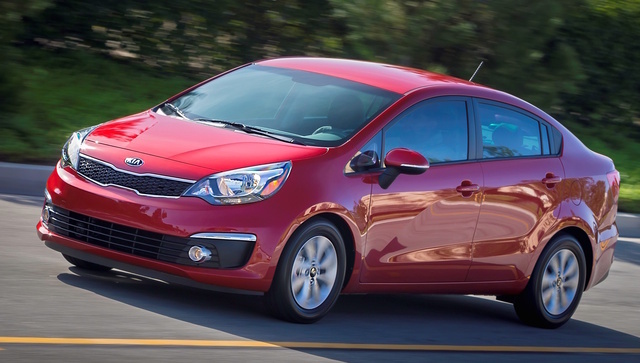 What's your take on the 2016 Kia Rio? edfor If you are the kind of person that lives in an area where you don't need A/C, a manual Rio,used with low mileage is very reliable and will run forever (150k or more) with minimal maintenance.Change your oil when the color begins to darken.I used to go with Japanese cars, in or around 2003 Korean cars began to take the lead for value. 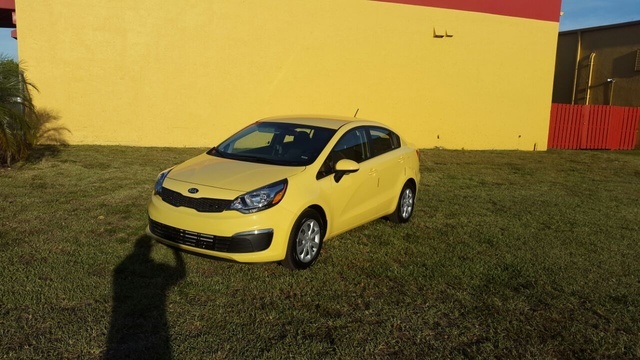 Have you driven a 2016 Kia Rio? 2016 Kia Rio Key Want Turn After Put In Switch! 2016 Kia Rio put key in switch and want turn! I'm having a problem with my 2016 not starting most of the time. My battery and starter are good. I don't know what the problem could be.